Mellerud, is a range of powerful cleaning solutions that are design to get stubborn cleaning jobs done first time, every time. Products are formulated to tackle specific cleaning tasks, whether that’s kitchen, bathroom, garden or even caravan cleaning. 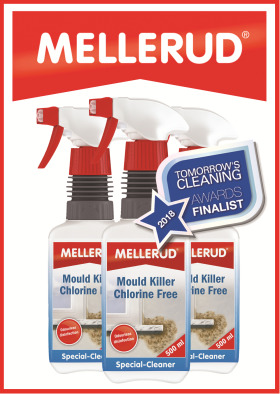 Bestsellers include; Chlorine Free Mould Killer, Bathroom Cleaner, Grout Cleaner, Kitchen Degreaser, Oven & BBQ Cleaner, Drain Unblocker and Garden Furniture Cleaner. According to the company, stockists get great margins and potential space savings of 50% compared to rival brands on an equivalent range, thanks to the square bottles and innovative point of sale merchandising. The range is backed up with Centurion’s personal sales support and great customer service.